Too Old to Rock ‘n Roll: Too Young to Die! Perhaps it’s not in the pantheon of Jethro Tull’s greatest albums, but Too Old to Rock ‘n Roll: Too Young to Die! represents the band still at its career peak in the ’70s. 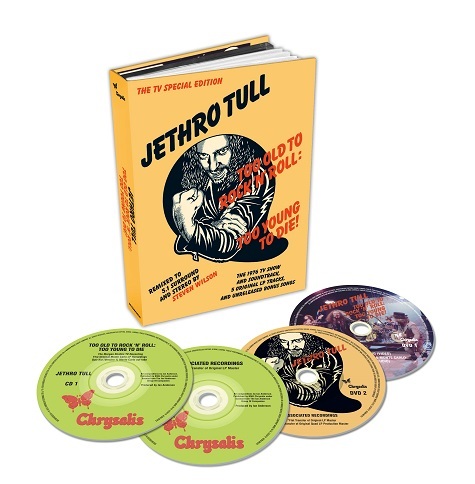 A transitional record between Tull’s theatrical progressive rock period (Thick as a Brick, A Passion Play, WarChild), and the band’s folk rock trilogy (Songs from the Wood, Heavy Horses, Stormwatch), Too Old to Rock ‘n Roll is still somewhat underrated 40 years after its initial release. Like A Passion Play, it was born out of an aborted project—in this case a stage musical about an over-the-hill rocker whose music becomes relevant again. The best known song of the album– a mixture of the band’s theatrical rock and acoustic, Elizabethan folk– is the self-deprecating title track. It’s one of Tull’s beloved songs, but there are some other good ones in the bunch: the whimsical “Quiz Kid” (with the typo fixed from the originally titled “Quizz Kid”); the lovely ballad “From a Dead Beat to an Old Greaser,” the hard-rocking “Taxi Grab” (which sounds somewhat similar to Minstrel and the Gallery) and the very sweeping anthem “The Chequered Flag (Dead or Alive).” Following the previous installments of the Jethro Tull reissue program, Too Old to Rock ‘n Roll has been remixed by Steven Wilson and features both the original album and re-recorded versions of the songs that were used in a TV special, which is also on the DVD portion of the lavish set. (It’s great to see Ian Anderson ham it up as he’s always done onstage for the TV program) Liner notes freaks will find also find an extensive essay covering that period of the band’s history, the story behind David Gibbons’ cartoon strip from the original album, along with a touching tribute to the then-new Tull member, the late bass player John Glascock. Too Old to Rock ‘n Roll: Too Young to Die! may not be the perfect Tull album on the level of Aqualung and Thick as a Brick, but it deserves another listen after the mixed reception it received at the time.